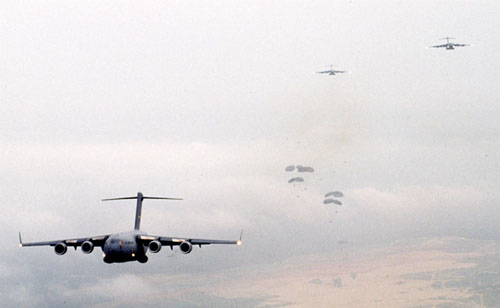 As paratroopers are deployed from aircraft flying in formation, the paratrooper jumping from a trailing aircraft crosses the unsteady wake flow generated by the leading aircraft. This could subject a paratrooper/parachute system to destabilizing aerodynamical forces. Similarly, a small, trailing aircraft might face the destabilizing wake of the larger, leading aircraft. In both cases, simulations would involve computation of unsteady wake flow in the long region between the two objects, and the influence of this wake flow on the secondary object. This creates a major computational challenge because the two objects are separated by a large distance compared to the length scales of the objects, and therefore unsteady flows need to be computed accurately over long wake regions. The T*AFSM has developed the Multi-Domain Method (MDM) [10, 13-14] to address this computational challenge. The simulation domain is divided into an ordered sequence of overlapping subdomains. Subdomain-1 (SD-1) and Subdomain-3 (SD-3) would be used for computation of flow around the primary and secondary objects, respectively. Because these objects would have complex geometries, such as an aircraft or a parachute, these domains are discretized with unstructured meshes, and the flow solver is based on a general-purpose finite element implementation. Subdomain-2 (SD-2), which connects SD-1 and SD-3, would be used for computation of the wake flow generated by the primary object. SD-2 is discretized with highly- refined structured meshes. A special-purpose finite element implementation for structured meshes has been optimized to yield much higher computational speeds compared to a general-purpose implementation. Computation over SD-2 can also be accomplished by other methods which might be more desirable for structured grids. For cases when the parachute deformation is taken into account, the computations in SD-3 are carried out with the DSD/SST formulation [1-11, 15-20], which was developed by the T*AFSM for computation of flows with moving boundaries and interfaces, including fluid-structure interactions. In a joint project with US Army Natick Soldier Center, the multi-domain method has been demonstrated in computation of a parachute/payload system crossing the wake of an aircraft. Simulations were carried out on a CRAY T3E-1200. The figures show the air pressure distribution on the surface of the aircraft and the streamlines, as well as the streamlines for the parachute. These simulations were were reported in [10-14]. 11. T. Tezduyar, Y. Osawa, K. Stein, R. Benney, V. Kumar and J. McCune, "Numerical Methods for Computer Assisted Analysis of Parachute Mechanics", Proceedings of 8th International Conference on Numerical Methods in Continuum Mechanics, Liptovsky Jan, Slovakia, CD-ROM (2000). 12. T. Tezduyar, Y. Osawa, K. Stein, R. Benney, V. Kumar and J. McCune, "Computational Methods for Parachute Aerodynamics", Computational Fluid Dynamics for the 21st Century (eds. M. Hafez, K. Morinishi and J. Periaux), Springer (2001). 13. T. Tezduyar and Y. Osawa, "The Multi-Domain Method for Computation of the Aerodynamics of a Parachute Crossing the Far Wake of an Aircraft", Computer Methods in Applied Mechanics and Engineering, 191 (2001) 705-716. 14. T. Tezduyar and Y. Osawa, "Fluid-Structure Interactions of a Parachute Crossing the Far Wake of an Aircraft", Computer Methods in Applied Mechanics and Engineering, 191 (2001) 717-726. 15. Tayfun E. Tezduyar, "Finite Element Methods for Flow Problems with Moving Boundaries and Interfaces", Archives of Computational Methods in Engineering, 8 (2001) 83-130; also in Lecture Series on Finite Elements in Fluids, T.E. Tezduyar, University of Tokyo, April-May 2001. 16. T. Tezduyar, "Finite Element Interface-Tracking and Interface-Capturing Techniques for Flows with Moving Boundaries and Interfaces", ASME Paper IMECE2001/HTD-24206, Proceedings of the ASME Symposium on Fluid-Physics and Heat Transfer for Macro- and Micro-Scale Gas-Liquid and Phase-Change Flows, ASME, New York, New York, CD-ROM (2001). 17. K. Stein, T. Tezduyar, V. Kumar, S. Sathe, R. Benney, E. Thornburg, C. Kyle and T. Nonoshita, "Aerodynamic Interactions Between Parachute Canopies", to appear in Journal of Applied Mechanics. Rice University MEMS Preprint 2002-017. 18. K. Stein and T. Tezduyar, "Advanced Mesh Update Techniques for Problems Involving Large Displacements", Proceedings of the Fifth World Congress on Computational Mechanics, Vienna, Austria, Web Site (2002). 19. T. Tezduyar, "Interface-Tracking and Interface-Capturing Techniques for Computation of Moving Boundaries and Interfaces", Proceedings of the Fifth World Congress on Computational Mechanics, Vienna, Austria, Web Site (2002). 20. K. Stein, T. Tezduyar and R. Benney, "Applications in Airdrop Systems: Fluid-Structure Interaction Modeling", Proceedings of the Fifth World Congress on Computational Mechanics, Vienna, Austria, Web Site (2002).